Witness the excitement, tension and fun exhibited at Ireland’s country fairs in Beidh Aonach Amárach on Thursday 10th January 2019 at 9.30pm on TG4. 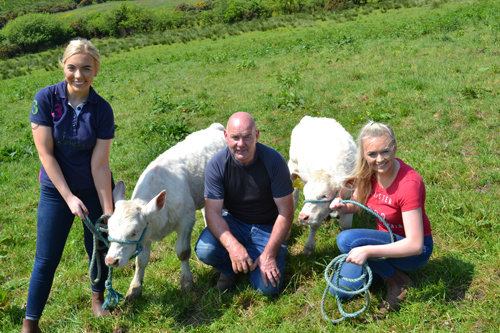 With 140 agricultural shows across Ireland, thousands of competitors spend months of preparation before travelling the country to take part in the competitions each weekend. Beidh Aonach Amárach provides an insight into the lives of those who take part in these shows every year. Beidh Aonach Amárach was produced by Crawford McCann Ltd for TG4 and BBC Northern Ireland with funding support from Northern Ireland Screen’s Irish Language Broadcast Fund. The six-part series showcases competitors who give their everything to be Best in Show; from cakes to cattle; flower-arranging to sheep-shearing; show-jumping to shiny cars; as well as the best in vegetables, dogs, birds, clothes, arts and crafts. Beidh Aonach Amárach also features the army of volunteers who organise and judge these events every year. The series takes viewers into the heart of the country show scene in Ireland, featuring the very big – Balmoral and Tullamore; the very picturesque – West Kerry and Glencolmcille and the traditional – Finn Valley and Clogher Valley. BEIDH AONACH AMÁRACH was produced and directed by Bernadette Morris and was Executive Produced by Mairéad Ní Nuadháin and Kelda Crawford-McCann for Crawford McCann Film & TV. Beidh spórt, spraoi agus teannas ann nuair a bhuailfimid bóthar le lucht na dtaispeántas feirme in Beidh Aonach Amárach ar Deardaoin 10ú Eanáir ag 9.30pm ar TG4. Gach bliain bíonn 140 seó nó taispeántas talamhaíochta sa tír agus ar feadh roinnt mhaith míonna roimh an lá bíonn na mílte iomaitheoirí éagsúla ag réiteach. Tugann Beidh Aonach Amárach léargas dúinn ar shaol na ndaoine a ghlacann páirt sna seónna seo achan bhliain. Léirigh Crawford McCann Ltd Beidh Aonach Amárach do TG4 agus do BBC NI le tacaíocht ó Chiste Craoltóireachta Gaeilge Scáileán Thuaisceart Éireann. Taispeánain an tsraith de sé chlár seo dúinn na daoine a bhéas in iomaíocht do na príomhdhuaiseanna agus caitheann siad dua leis an iarracht – is cuma mura mbeidh acu ach pocaide gabhair – beidh siad i lár an aonaigh! Léirítear fosta an slua mór taobh thiar den iarracht- maoir, moltóirí, coistí deonacha agus slua cúntóirí i ngach baile a mbíonn taispeántas ann. Sa tsraith seo feicfear taispeántas den uile chineál- na cinn is mó – Balmoral agus An Tulach Mhór; na cinn ghleoite –Seó Talmhaíochta Chíarraí Thiar agus Gleann Cholm Chille agus na cinn traidisiúnta – Gleann Fhinne agus Gleann Clochar. Is í Bernadette Morris a raibh mar léiritheoir/stiúrthóir ar Beidh Aonach Amárach agus is iad Mairéad Ní Nuadháin agus Kelda Crawford-McCann do Crawford McCann Film and TV a raibh mar léiritheoirí feidhmeannacha ar an chlár.